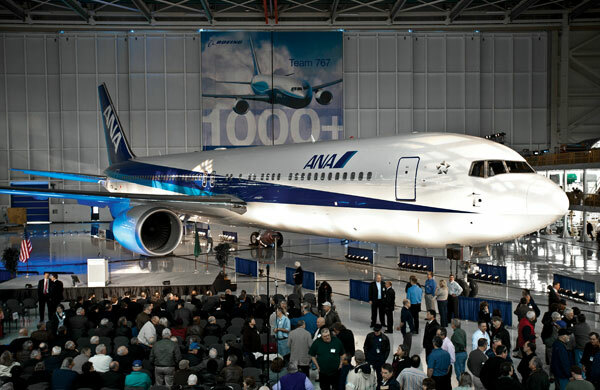 When the 1,000th Boeing 767—a 767-300ER—rolled off the original assembly line, history was marked in two ways. The rollout marks 29 years of service for the venerable wide-body twinjet just as 767 production moves to a new, smaller bay design to improve efficiency. With a typical seating capacity of 181 to 245 passengers, 151 operators fly the 767 worldwide. More than 990 have been delivered, and the type is used on the trans-Atlantic route between the U.S. and Europe more than any other airliner. The 767 also pioneered the use of a two-member crew on a wide body and maintains common type rating with only one other aircraft—Boeing’s narrow-body 757.